Preserve your investment by offering your car and truck top quality parts! Drop by for a visit and put us to the challenge! We have a full range of products related to engine management, including ignition and emission parts, on-board computers, ignition wires, battery cables and fuel system components. 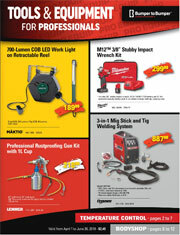 We invite you to discover our wide range of auto repair and body work products. Our experts will assure that you will have everything you need to complete your projects! April 4, 2019 | Featured this month is the 2 post lift by Hennessy at $115.41 a month. Offer valid until June 30, 2019. See in-store for details. March 8, 2019 | Featured this month are High Performance Soldering Irons by Weller starting at $26.99. Offer valid until March 31, 2019. See in-store for details. B & T Parts and Supplies is a new and remanucatured auto parts business. Backed by the largest network (Uni Select), B & T Parts and Supplies offers the very best brand name automotive parts and shop supplies. We are industry experts!